As many of you may already have heard, another monkey has made the news and while we may never know the whole story of how this "biting incident" happened, one thing is certain. Noah needed our help. Just like with any innocent animal or child for that matter, monkeys are totally helpless and at the mercy of their caregiver to love and protect them. When that isn't the case, it becomes the responsibility of every monkey mom to step in and do what we can. After generous donations from the monkey community and help from an intervening "angel" Noah is now, at last in a safe haven. With help and support from the monkey community his medical needs have been met, he is in his new forever home and he is thriving and acquainting himself with his new mom and dad. Had nothing been done, he would have been forced to live the remainder of his life caged without companionship, or left to the state and euthanized. His story is written below by the "angel" who rescued him and she can tell it best. Noah, looking happy and healthy after his visit to the vet and introduction to his new parents. Here he is enoying a day of soaking up the sunshine in his outdoor compound. First I would like to give the details of Noah's life to those who are interested in the follow up story of Noah. Noah was born in Chesapeake, Virginia at Spellbound Facility owned and managed by Gayle O'Neal. He was born on April 26, 2002. 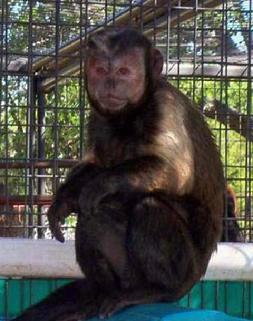 On the paperwork that I have, Noah is called a Tufted Capuchin, which I would agree by his appearance. He was sold to Kimberly A. and Joseph G. Hamrick(should be Hamric) for $5,500.00 on June 13, 2002. I have in my possession a copy of the Exotic Animal Bill of Sale signed by Gayle O'Neal and a copy of her USDA paperwork that was provided at the sale. I also have a copy of various medical records all previous to 2006. There is a copy of Noah's paperwork from SARA as a service animal as well as a picture of his service animal card used as proof of being a service animal given by SARA. I am now also in possession of a contract signed by Joe Hamric and three witnesses that Joe has transferred full ownership of Noah to me, Peggy Rice. I have promised him to make sure that Noah is with a companion of his kind and in a "home" situation which he was accustomed to. Joe does not want him to be a breeder or live as a breeder as he had the option of giving him back to the original breeder, Gayle O'Neal, but he refused due to wanting a home for Noah. As we know, in the beginning of March, 2010, Noah became aggressive to his owner, Joe "Babe" Hamric and bit him severely, sending him to the hospital. When I saw this on the news, I remember going to visit Noah and Joe a couple years ago during a battle he was having with Chesapeake County trying to keep Noah as a Service Monkey. He won, receiving his permit from the county and I wanted to meet Noah so my sister Polly and I went taking Lil Joe and Darla. We had a wonderful visit as he showed me emails and letters that poured in to support Joe. During that visit, Joe told us how he had "accidently" killed his other service monkey, "Caled" with a piece of furniture while trying to catch him. As Noah snuggled and loved on Polly and I, Joe said that he wish Noah would do that to him, but that since Noah saw his brother die, he did not trust Joe like that, BUT Joe loved Noah. Now, 2 years later, hearing about this "attack" I knew that mistrust had grown and called animal control and warned them there would be another attack due to this mistrust issue. I was told by Kathy Strouse of Animal Control that there was nothing she could do as Joe was not pressing charges and no "law" had been broken. Later that day, Dan from Channel 3 news of Norfolk called me asking me to do an interview as a non-human primate owner and my opinion of the cause of Noah's aggression. I accepted and as you might have seen on the news, I did the interview even explaining that we had a home for Noah to have a companion of his species. During this time, I was in constant contact with Gayle O'Neal about Noah's well-being. The goal was to remove Noah from this bad situation before something happened again. I know that Gayle wrote letters to SARA, Animal Control and spoke to the media trying to gain control for Noah's sake. She had reported to me that Noah was not paid for completely so she was using this to try to gain custody of him. Joe denied this to her and to me later in conversation. Anyway, the goal was for Noah to be helped and we would take the first opportunity to do that. Again, two weeks after the initial attack, Noah attacked Joe again sending him to the hospital for another surgery. Just before Joe's surgery, his brother Bill made the statement that Noah would be put down. The media contacted me early the next morning and said, "Peggy, you were right, Joe is in the hospital again." Animal control made the statement that Noah would be put down if Noah was turned over to them. My heart sank at this thought, as Noah's behavior was NOT HIS FAULT. The next day, Joe was released from the hospital. Gayle called me to let me know that Joe was NOT putting Noah down, but rather he was placing him in a small zoo type-setting although there were no Capuchins there. Gayle told me that there was nothing we could do, it was up to Joe. I was just glad that he would live and have a different life, even if he did not have a companion like he use to! Dan from the media went to do an interview with Joe on Wednesday, March 31, 2010, as he was giving Noah to the zoo. He asked Joe if he had seen the news piece containing the "lady and her monkeys" on the Eastern Shore of Virginia. Joe said, no, so Dan showed him the video. Immediately, Joe remembered me and told Dan," wait.....I want Noah to go to her. I remember her." Dan called me and told me to expect a call! In about an hour, I received a call from a man, Randy Jackson calling for Joe asking me to please take Noah and when could I come. I said, yes and I could come later that day. I called Gayle to tell her the wonderful news. I had goose-bumps thinking about Noah has gone from death's door, to a zoo without a companion to me, which leads him to a home with a Capuchin companion. On Wednesday evening, my sister Polly and I headed to Chesapeake which meant crossing the 22 mile bridge/tunnel separating the shore from the rest of Virginia to obtain Noah. We arrived about 7:30 pm to Joe's home which had media people and equipment everywhere. They asked if they could come in and "see" us get Noah....which I replied, "No. He has been through enough stress." I took Polly and I over 2 hours to be able to safely obtain Noah from his make-shift box and into my travel cage. As we left, I promised Noah a new life. Of course, Noah does not know the support that he has already received from non human primate owners all over via the internet and will continue to receive to get for medical expenses. He has 3 K9s as one of the K9s appear to be broken off at the base. I have no records for any medical treatment since 2006. Today, April 2, 2010, I was told by Randy Jackson that PETA has stepped up to the plate looking for Noah to bring him to the "place" they have in Texas. Noah right now is too busy eating fruit and vegetables and watching TV and is with people who are loving, scratching and talking to him non- stop. 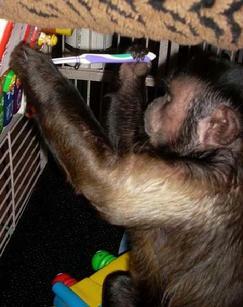 My goal for Noah is to have a home setting where he is with another Capuchin and an experienced Capuchin owner. I will take consideration of those who feel they could supply that after his medical work is completed. I want to thank EVERYONE for their promises of donations and support help for Noah's medical bill. Again, I believe..... ...."Noah found grace in the eyes of the Lord".